Walter visits Israel's SpaceIL program. Plus, Malcolm Hoenlein at the Conference of Presidents of American Major Organizations. An Israeli team joined the Google Lunar X Prize competition for the race to the moon. They will be sending the smallest ever spacecraft on a one way journey to land on the moon. The budget is a mere 38 million US dollars and most of that money is already in the bank, mainly from Israeli sponsors. Israel’s largest companies are excited about the project and supporting it. Blast off is in about 18 months and the preparations are on schedule. Walter’s World will follow the progress. In this programme you will hear the response of Malcolm Hoenlein, executive director of the Conference of Presidents of American Major Organisations, to last week’s speech by the US Ambassador and the address by Prime Minister Binyamin Netanyahu about the State of the Nation and lot’s more that’s orbiting in Walter’s World. SpaceIL lunar craft. Photo courtesy SpaceIL. Yariv Bash and Daniel Saat of SpaceIL at the Jerusalem Press Club. Photo courtesy SpaceIL. 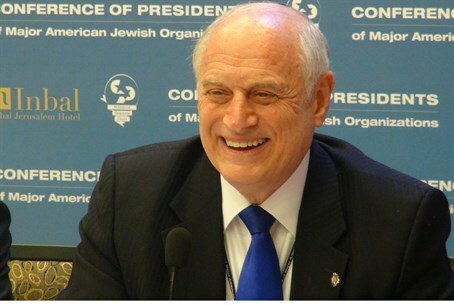 Malcolm Hoenlein, the executive vice chairman of the Conference of Presidents of Major American Jewish Organizations. Credit: Flash90.